In Search of Happiness gripped me from the dedication page. The dedication is an affirming beginning and sets out the tone for the book. A book about self-discovery, family, loss, and ultimately love. 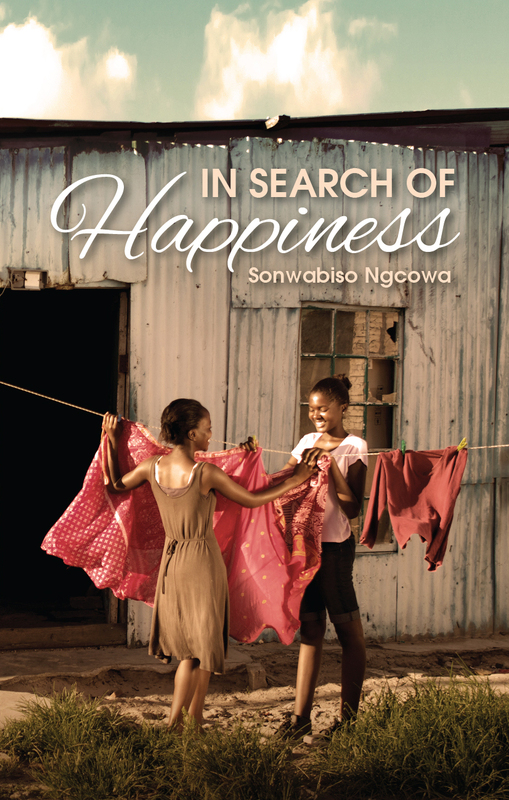 Sonwabiso Ngcowa’s In Search of Happiness succeeds because of its accessibility, the book that can be read by teenagers and adults. It succeeds because it is a story about a black young woman, Nanase, and her journey from the Eastern Cape to the Western Cape. It succeeds because it is about discovering that you can find love in places you never thought it could be. This book succeeds because it centres the life of a young black woman who falls in love with another young black woman. This book succeeds because it centralises a love story that is often not seen as a love story in this country. While many may still consider LGBTI (lesbian, gay, bisexual, transgender, intersex) lives a taboo subject, Sonwabiso dares to go there. LGBTI South Africans are often depicted as people without friends, without brothers and sisters, without parents. They are rarely seen as parents themselves. 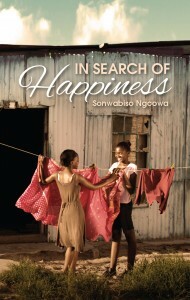 Sonwabiso’s lead character, Nanase, is a young woman with friends, a grandmother that she loves, she has a mother and father, and she has siblings. Nanase’s story helps society see LGBTI people as part of social circles and coming from families and that homophobia doesn’t just hurt the individual but entire families. There is something very real about Nanase’s journey of discovering her attraction to another woman when she moves to Masiphumelele, Cape Town. Although there is a sense of ambivalence in Nanase while she is in the Eastern Cape about her sexual identity, it is not until she moves to Masiphumelele and she meets Agnes that she fully comprehends what’s going on inside her. In Agnes she finds someone she can experience and experiment her feelings with that she had bottled up inside her. Every chapter tittle in the book is in English but is accompanied by a Xhosa translation. I like this infusion of vernacular language in English texts; maybe we are moving into a time where English fiction will be heavily infused with the vernacular. That is after all how many South Africans speak. Sonwabiso captures the way people in the Eastern Cape view Cape Town. In the Eastern Cape, Cape Town is seen and talked about as the place of dreams, a place where people go and realize their dreams hence the popular phrase “iKapa lodumo” which translates to “the Cape of Fame.” Of course, like most people from the Eastern Cape, Nanase soon finds out that iKapa lodumo is not exactly what it is cracked up to be because it comes with it’s own set of challenges. Sonwabiso gently manages the issue of difference in this book. South Africans pride themselves of being a diverse country, but at the same time South Africans are intolerant of difference. Difference in South Africa must come in neat and familiar ways in order for it to be palatable. As Nanase discovers that she is different and that her neighbour is also different, she has to deal with intolerance of the community and her friends at school. She has to deal with the mean spirit of people who refuse to constructively engage with difference. This book is an easy read that touches on very complex issues that people living in townships of South Africa are dealing with. Sonwabiso touches on homophobia, xenophobia, sexual assault, and poverty. These are hard issues to deal with, but Sonwabiso manages to mindfully weave these things together showing us that they are connected. Where you find gender violence you are likely to find homophobia and where you find homophobia you are likely to find xenophobia and so it goes. In Search of Happiness is aptly titled because we all share this quest for a happier and a more fulfilling life. Like the rest of us Nanase is trying to find her way through a world structured to her disadvantage. In Search of Happiness is the type of book I wish someone had given me when I was in high school going through my own self-discovery phase. To say this book is timely would be an understatement. This is a must read for high school going young people. It is a must read for all South Africans who are interested in what it means to be young in post-apartheid South Africa. This is a must read if you are interested in stories about young black people written by young black people.